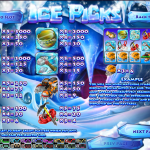 Ice Picks is a 5 reel slots game released in 2011 by Rival. 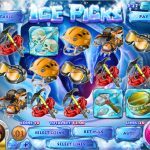 We have no idea why they decided there is a need to set a slots game during the ice age period but they did! and it actually works! You basically have to uncover all the treasures that lay deep under the thick ice and let’s not forget some cool bonus features too. The Crate symbol is the Wild in this game and it will substitute any other symbol (except the scatters) to create a winning combination. The second scatter is the Compass symbol. 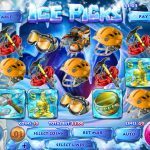 When you land 3, 4 or 5 of it you will get 5, 10 or 20 Free Spins respectively with a 3x multiplier and a chance to re-trigger the Free Spins again! Oh and another nice bonus is with all the buried in ice symbols like: Stone Hammer, Skull, Vase, Buddha Statue and Jewels. When you get a winning combo with them they will collapse and be replaced by other symbols. It’s another nice way for winning a Free Spin! This is definitely one of the better slots game we’ve encountered. The design and graphics are nice and it is fun and engaging. The bonus features makes it something that give a very nice edge over other similar games. We strongly recommend! Always dreamt about founding oil in the ground? Try playing Gushers Gold a 5 reel slot by Rival.